This extraordinary topaz gem is labeled 22,892.5 carats. It is displayed in the Smithsonian Museum of Natural History and it's origin is Minas Gerais, Brazil. 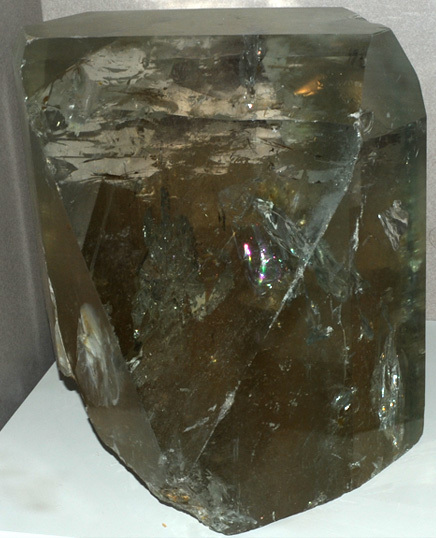 It is cut with 172 facets and has a mass of 4.6 kg and measures about 18 cm across. It is classified as American golden topaz, and the composition is Al2SiO4(F,OH)2, a silicate of aluminum which contains fluorine. Gem-cutter Leon Agee fashioned it over the course of two years in the late 1980's from an 11.8 kg (26 lb) crystal. Topaz has a hardness of 8. 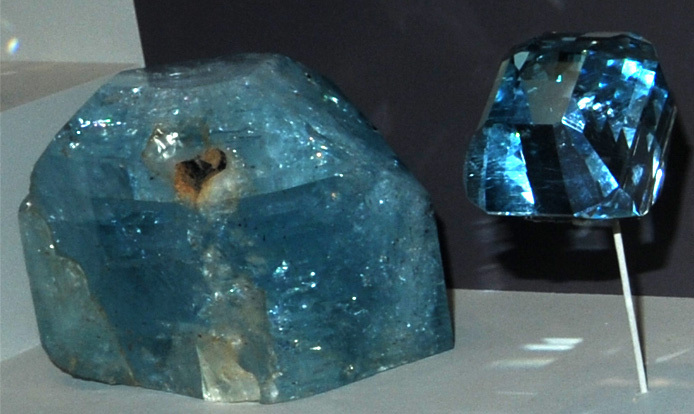 Some of the topaz crystals which come out of Brazil are enormous! The tallest crystal at right is about 50 cm tall. And the crystal below is even bigger, measuring 60-70 cm across. It is from Minas Gerais, Brazil. These two topaz crystals are 50.4 kg (111 lb) and 31.8 kg (70 lb). They are from Minas Gerais, Brazil. These are to of the finest large topaz crystals. Before coming to the Smithsonian, they were slated to be cut up for use in scientific instruments. What look like bubbles rising inside are imprints of albite crystals that once grew against the back surfaces of the crystals. 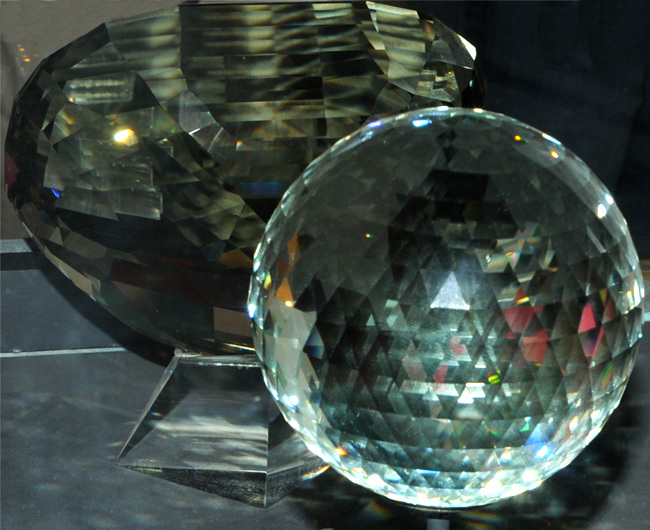 This topaz sphere measures 12,555 carats. The pale golden sphere has over 1000 facets, cut by a gem cutter in Idar-Oberstein, Germany in a location where there have been gem cutters since the 15th century. The source of the topaz is listed as Minas Gerais, Brazil, the origin of so many other remarkably large crystals. 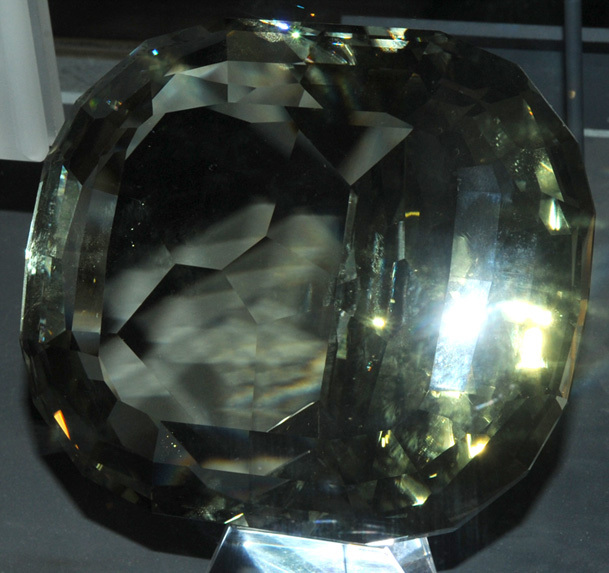 Behind the sphere is the back side of the large gem shown at the top. 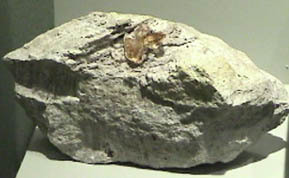 This example of a growth habit of topaz is from Thomas Range, Juab County, Utah. It is described as being formed with bixbyite. The overall sample size is about 10x5 cm. The source of these topaz samples and gems at left and below is listed as Ouro Preto, Minas Gerais, Brazil. 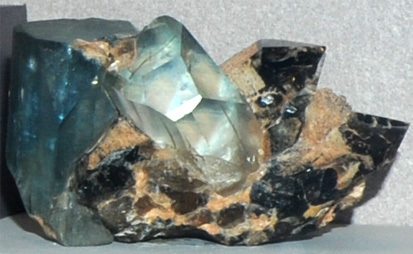 Most topaz is pale or colorless. 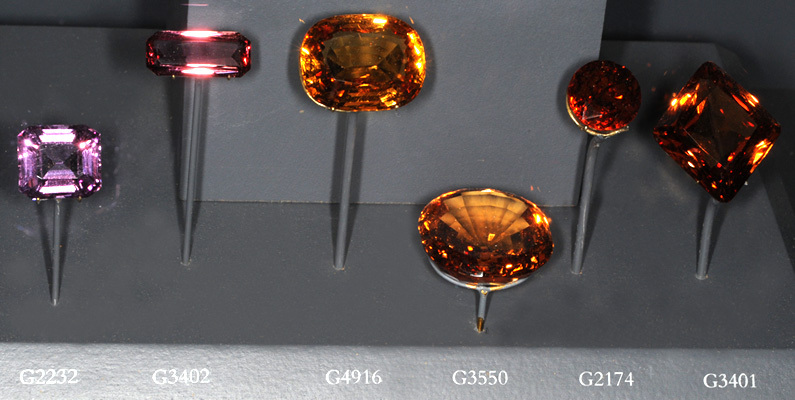 These examples of the highly prized golden, or imperial, topaz come from Brazil, it's only known source. The tallest column at left is about 20 cm high. The left sample above is from Sakangyi, Mogok, Burma and is about 20cm high. The right sample is from Ariranha, Minas Gerais, Brazil. This topaz sample is from Aguas Vermelhos, Minas Gerais, Brazil. The sample is about 17 cm wide, and the sample in front of it is a segment of that sample which has been irradiated, showing that irradiation can change the color centers in such crystals. 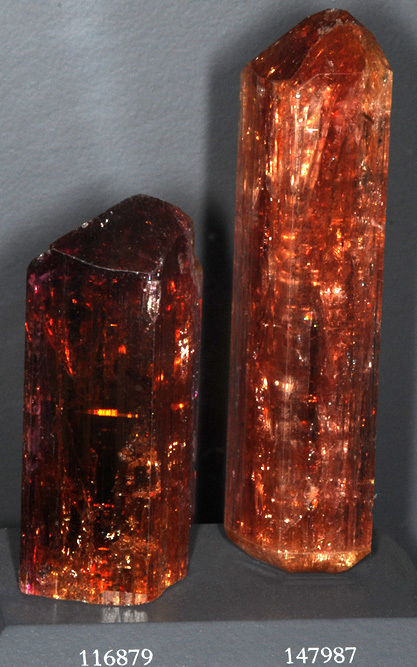 These are examples of irradiated topaz, all from Minas Gerais, Brazil. The left gem is 7,033 carats, the center gem 571.5 carats, and the right gem 2470 carats. The left gem is about 10 cm wide. 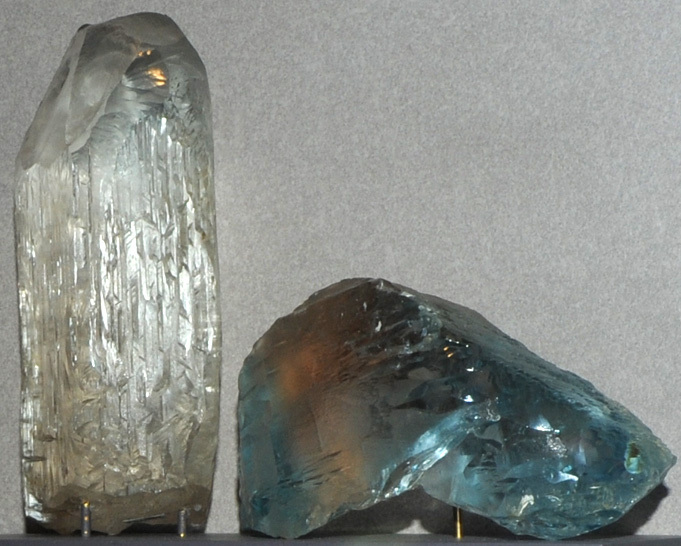 These topaz samples are from Volodarsk Volynskiy, Zhitomir, Ukraine. The right sample is about 15 cm wide. 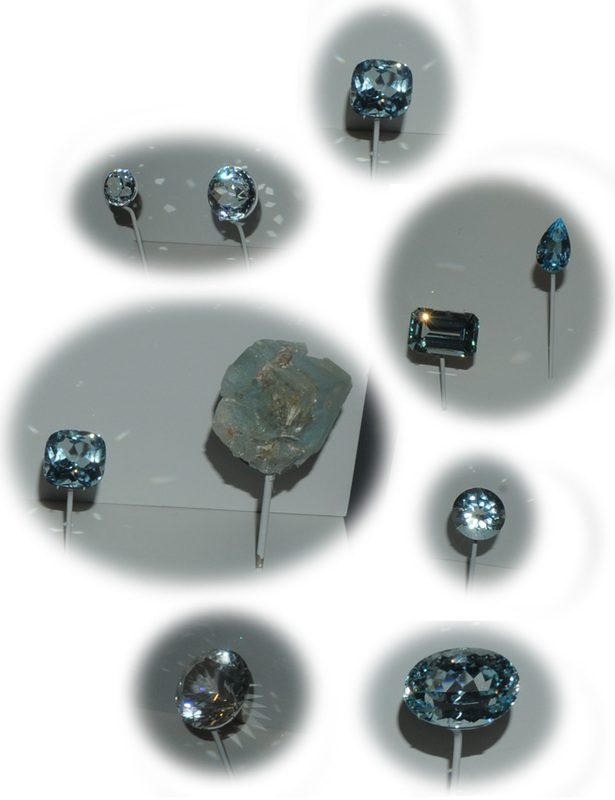 These blue topaz samples are from Mursinka, Neyva River, Ekaterinburg, Urals, Russia. The gem is 815.6 carats. The crystal sample is about 12 cm wide. 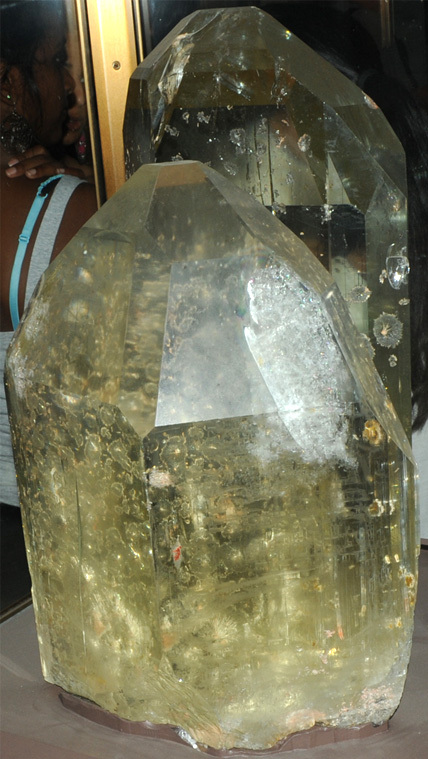 This topaz crystal was so large, its transfer to the Smithsonian made the newspaper! 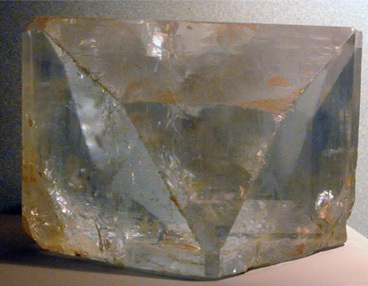 The 75 kg (153 lb) crystal was the first giant gem-quality topaz crystal found. It weighed in at 350,000 carats. It was discovered in the late 1930s in Brazil. 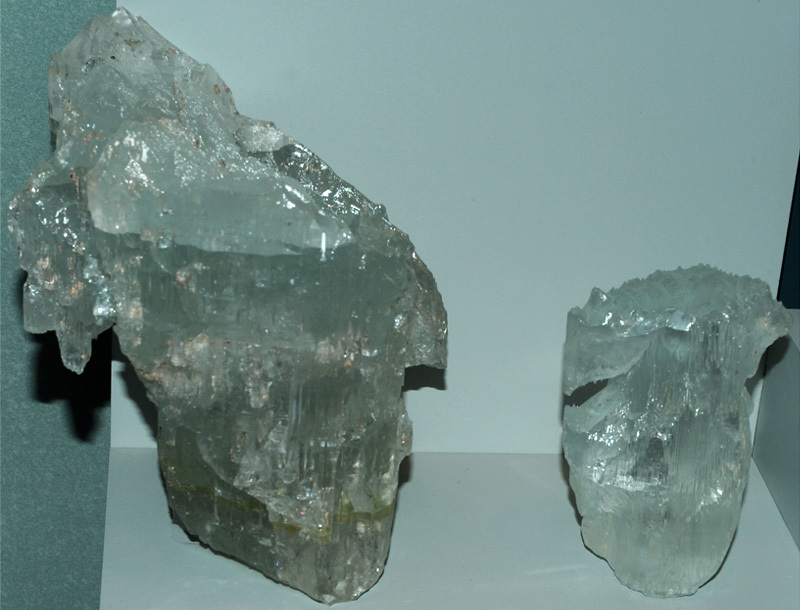 Later discoveries in the same area turned up a crystal more than four times this size. It is from Ferros, Brazil and scales about 35x45 cm. 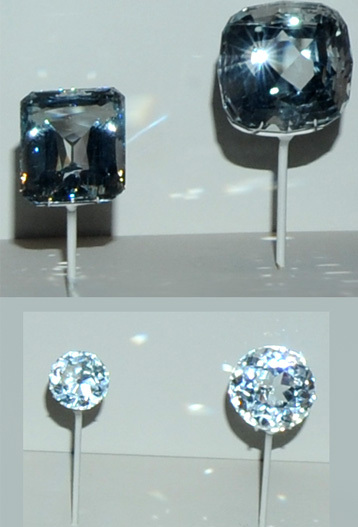 The top two topaz gems shown below are 155.5 and 296.6 carats and are from Alabashka, Mursinka, Ekaterinburg, Urals, Russia. The bottom two gems are 18.1 and 50.8 carats and are from Naegi district, Gifu, Japan. 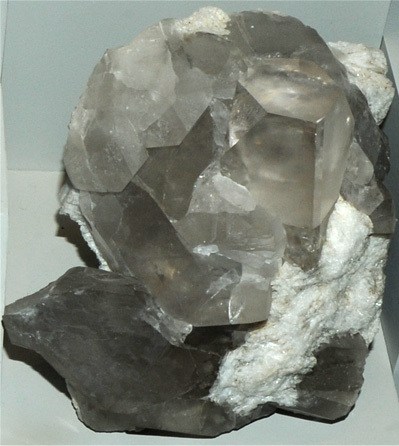 The sample below is described as topaz with elbaite, lepidolite and albite. It is about 12x13 cm and is from Minas Gerais, Brazil. 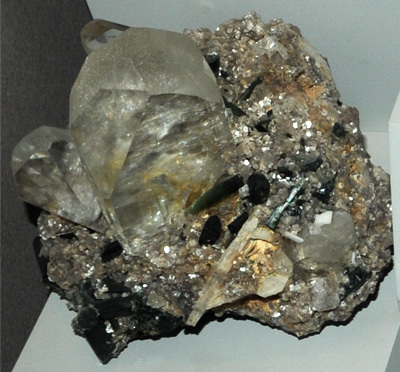 The sample at right is described as topaz with quartz and albite. 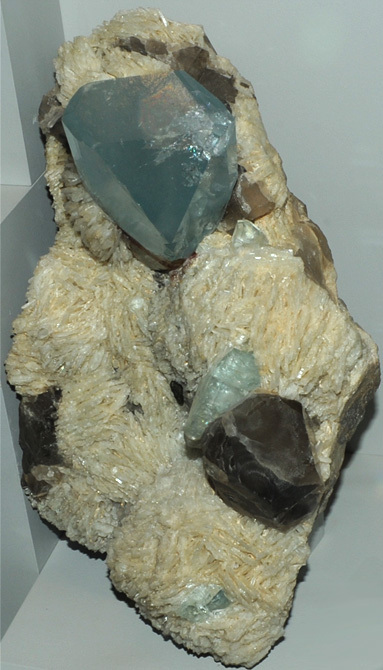 It is about 13x14 cm and is from Dassu mine, Skardu, Northern Areas, Pakistan. 43.7 carat gem from Maine. 49.9 and 17 carat gems from Ware mine, Aguanga Mountain, California. 24.4 carat gem from Bald Face Mountain, North Chatham, New Hampshire. 146.4 carat gem from Mason County, Texas. 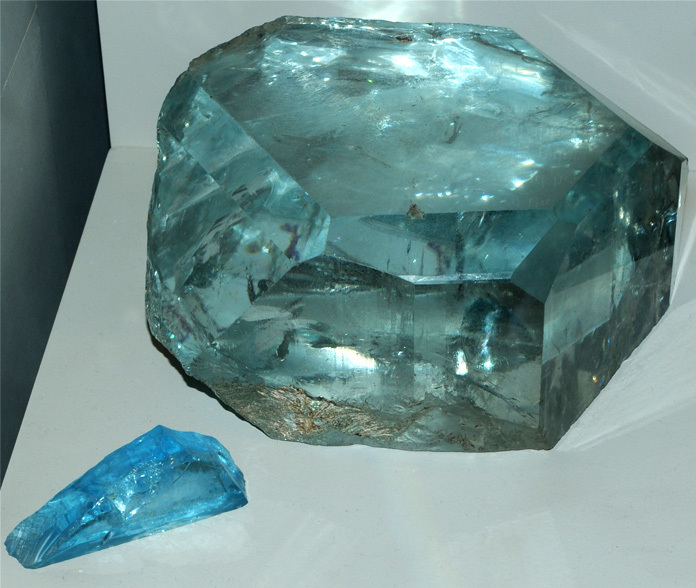 The same 43.7 carat gem shown as 1, plus a topaz mineral sample from Maine. 18.1 and 50.8 carat gems from Naegi district, Gifu, Japan. The sample at left is described as topaz with albite and quartz. It is about 14x25 cm and is from Little Three mine, Ramona, California. The sample below is topaz with quartz and albite from Mursinka, Neyva River, Ekaterinburg, Urals, Russia. It is about 12 cm wide.